Helathy way for kids weight loss. Changes in lifestyle have made obesity an issue that even kids have to tackle. Today’s kids tend to indulge in a lot of fatty foods, but do not get proportionate physical exercise to burn it off. When kids turn out to be overweight, it becomes a big challenge for moms to make them eat responsibility. You can make the means of weight loss easier and tastier by serving your kids super-tasty but healthy choices like Steamed Corn with Tomato Salsa , Lentil Soup , etc. When we were kids we used to keep popping into the kitchen to munch on sweets and savouries. During the vacations, we would be totally out of control, binging on these snacks several times a day, losing count of how many burfis or chaklis we consumed. Nobody worried about weight gain or health problems as far as kids were concerned because we used to play outdoors for many hours a day, burning off all the calories consumed! However, changes in lifestyle have made obesity an issue that even kids have to tackle. The onslaught of packaged foods that are unnaturally, almost addictively tasty, and loaded with unhealthy ingredients is one of the main culprits. The increasing time that kids spend watching television and playing digital games adds to the problem. As a result, they do not get enough physical exercise to burn the fatty foods they consume, which makes the problem quite serious! Living in protected environments and in nuclear families, many kids are also temperamental, which makes it difficult to enforce food habits. The best way to change this is to create awareness amongst children about the health problems associated with foods they are eating, and replace them with equally tasty but healthy foods, so that kids will happily select the healthy choices over the fast foods. More than anything else, we adults have to teach them by example rather than preaching to them. If we stay away from the unhealthy foods and cheerfully substitute them with tasty but healthy options, kids will willingly follow suit! To do this, start playing a game of substitution. Identify all the culprits and replace them with healthier substitutes. For example, replace sugar with honey or maple syrup. It also helps to replace unhealthy cooking methods like deep-frying with healthier methods like steaming or baking. First and foremost, avoid sugar in the food. It triggers inflammation almost immediately in the body. Your blood sugar will rise and fat burning will stop in the stomach. Sugar also has a strange effect on your body. Once you start to have sugar-based products, you tend to continue feeling hungry and crave for more! This explains why kids cannot stop with a small piece of chocolate or candy. There is no use blaming them – blame the sugar instead! Slowly wean kids off sugar. When they yearn for something sweet, give them a fruit-based snack. Delight them with a healthy smoothie made of naturally sweet fruits like apples, strawberry and peaches, which are low in calories. Use almond milk and curds in your smoothie to make it healthier. Next reduce the consumption of full fat milk, and get your calcium from healthier sources like low-fat milk, curds and paneer. This awesome collection of tasty, kid-friendly recipes are made without full fat milk, bread, potatoes, sugar, and other no-no ingredients mentioned in the table below. We have used healthier substitutes. Yet, you will be surprised to see that your kids no longer miss the junk food, because they are happier with what they get instead! Start the day with a healthy breakfast instead of store-bought, sugar-laden cereals. Try giving a healthy oatmeal breakfast like Healthy Instant Oatmeal Recipe or Banana Nut Oatmeal Recipe. If they like to have a glass of milk, go for almond milk based beverages. Try the Almond Honey Cinnamon Milk. for a nutty taste. For lunch or the kids’ tiffin box, try Jowar and Vegetable Paratha or Spinach Hummus with Cucumber Sticks. Your kids will love to have healthy whole wheat parathas like Stuffed Spinach Paratha or Cauliflower and Green Peas Stuffed Beetroot Wrap. Vegetable wraps like the Masala Bhindi Wrap with Curd Dip are very interesting too! Skipping a meal or snack is the wrong way to handle obesity, especially in kids. They need to have their meals and snacks at the right time, but make sure they have healthy foods. So, when they come back hungry from school, treat them to a healthy but tasty snack like our classic Dosa, Dosa, or homemade jar snacks like Baked Whole Wheat Puris or Moong Dal Papadi. Kids like an element of fun in their food, so try something innovative like the Oats Bhel. Foods like pasta are not totally taboo. You can make healthier versions of whole wheat pasta, and serve them in limited portions. Go for the Whole Wheat Pasta in Tomato Sauce or Whole Wheat Pasta in Low Calorie White Sauce. It is good to keep some healthy, homemade jar snacks handy, so that if your kid feels hungry suddenly, they can munch on some of these instead of reaching out to some packaged, store-bought junk food! Fighting obesity in kids is a challenge because you need to strike a balance between health and taste. After all, childhood needs to be enjoyed and cherished in our memory all lifelong. So, do not be too harsh with your kids. Gradually replace the unhealthy foods they eat with equally tasty but healthy alternatives. Try to make this a playful exercise. Have a scorecard and add points every time your child says no to an unhealthy food and picks a healthy option instead. It also helps to let your kids inside the kitchen and let them experiment with cooking using healthy ingredients and cooking methods. Think of other fun-filled and happy ways in which you can make good health a way of life rather than preach its benefits. Only when kids make the choices consciously will they stick to them forever, even when you are not watching! 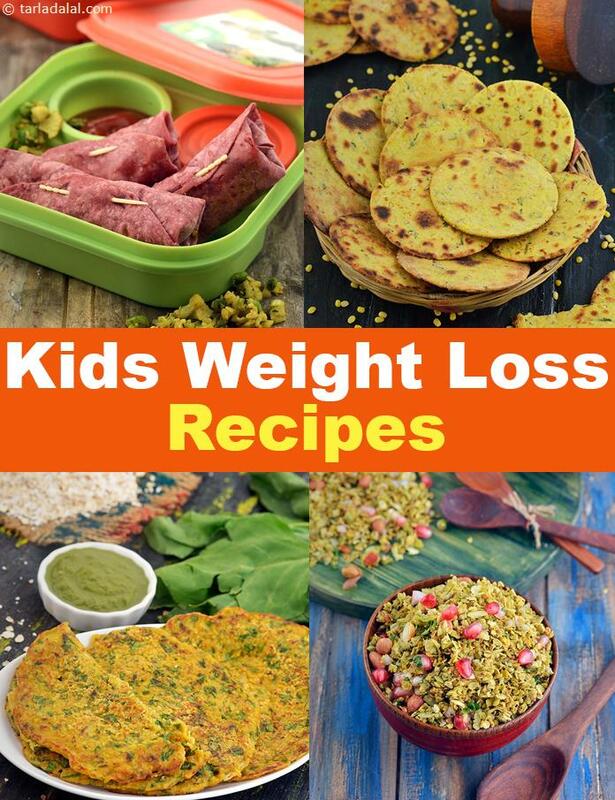 Enjoy our wide range of recipes for kids weight loss and other kids articles below.